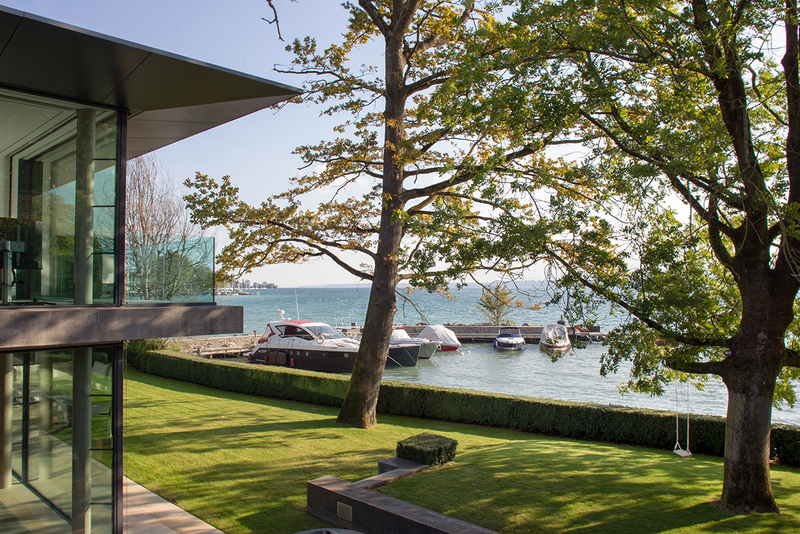 A glass-fronted contemporary villa, directly looking out onto the lake with its shimmering waters, like a mirror stretched out ahead: a rare privilege indeed. The nearby lights of Geneva sparkle, as the mountains including the majestic Mont-Blanc, are outlined against the sky. Sheltered from prying eyes, far from the hustle and bustle of daily life, yet closely attuned to essentials. The beauty of the site inspired Rémi Tessier in designing this glass villa in which the gaze roams freely between the inside and outside, creating a sense of complete osmosis with the surroundings, as well as providing a 180-degree view of the lake from all rooms. Stunningly spacious volumes enhanced by omnipresent transparency effects: pure serenity in three dimensions. Nothing could be simpler than a dedicated contact person for a necessarily tailor-made stay, with all the five-star services of the teams at La Réserve Genève, including a housekeeper, concierge and security. While the glimmering waters of the lake sometimes create mirages, the Villa du Lac works its own kind of magic. The absolute sense of intimacy pervading a private villa, and the freedom to live exactly as one pleases from day to day. A few steps through the grounds provides access to all the resources of La Réserve Genève: four restaurants including Switzerland’s only Michelin-starred establishment, the Spa Nescens with its indoor pool, the bar, the outdoor pool. Adjacent to the gardens of La Réserve Genève, the Villa du Lac offers an exceptional stay, set in splendid isolation facing Lake Geneva, with Mont Blanc on the horizon, while enjoying all the hotel facilities and amenities. Dressing room, ensuite bathroom, fitness area and balcony. Bedroom with bathroom; may be transformed into an office or a playroom. Extremely beautiful 160 sqm ground floor living area composed of a home movie area, two large lounges, a study nook and a dining room. Fully-fitted kitchen with a terrace for mealtimes. Strolling through the streets of the old town and coming across the birthplace of the author of Julie, or the New Heloise.